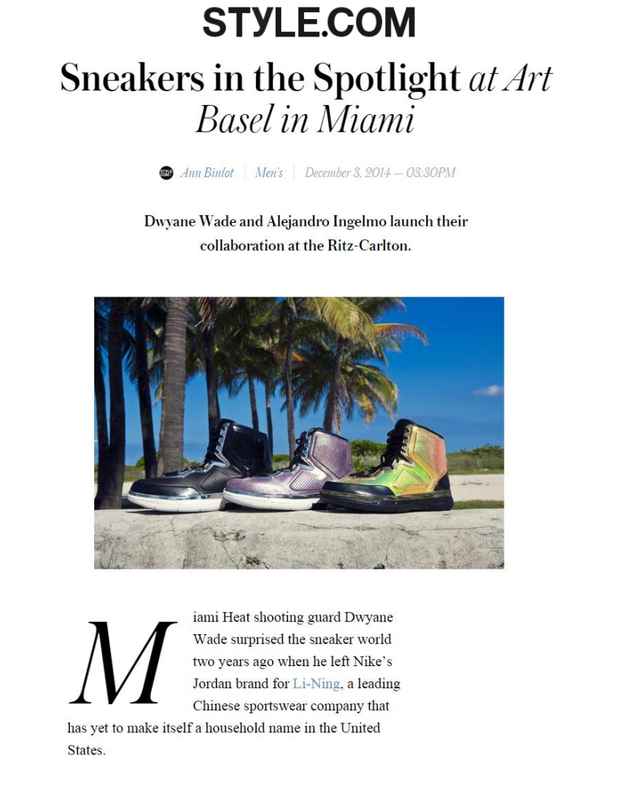 Dwyane Wade and Alejandro Ingelmo launch their collaboration at The Ritz-Carlton. Miami Heat shooting guard Dwyane Wade surprised the sneaker world two years ago when he left Nike’s Jordan brand for Li-Ning, a leading Chinese sportswear company that has yet to make itself a household name in the United States. Last night, Wade, who just returned to the Miami Heat’s starting lineup Sunday after a hamstring injury, used his day off to make an Art Basel appearance at The Ritz-Carlton Residences for the launch of his newest Li-Ning sneaker collection, Third Element, a collaboration with footwear designer Alejandro Ingelmo, who has his own namesake line and consults for some of the biggest luxury labels. Wade, who was dressed in an Armani tuxedo jacket and iridescent gold Third Element high-tops, is arguably one of the most stylish players in the NBA. His hope with the slick high-top sneakers is that Li-Ning will break into the lifestyle space. “When you talk about design, (We were interested in) something that was kind of classic and sleek. But how do you bring materials to life, and how do you add to it and make it colorful and wild and all those things?” said Wade. “He wanted to create something that was more fashionable, that was off the court,” added Ingelmo, who also counts Wade as one of his fans.